Are you unsure of how many tables you need for your event? Ask our knowledgeable staff to guide you through planning your corporate event. From tents to teaspoons! We have it all! Have a look at our product catalog and be confident that you’ll find all that you’re looking for! You read right! We will deliver, install and set up your tables and chairs to give your corporate event the perfect, professional and organized look! 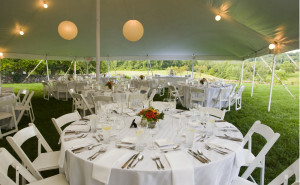 The Party Centre offers many sizes of frame and pole tents. Our tent sizes range from 10’x 10′ pop up tents to 40′ x 120′ feet pole tents. 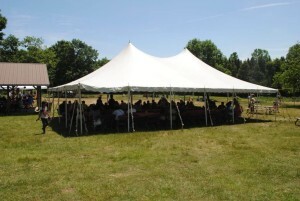 We can set up a tent for your corporate event on grass or in your parking lot. Our knowledgable staff and experienced tent installers will be happy to advise you with what kind of tent you require for your event depending on the number of your guests and the seating plan. Every event needs tables and chairs. Whether you require tables for your staff to sit down and eat or require tables for display at a trade show, The Party Centre has the inventory to fulfil your requirement. We carry the table cloths, napkins and table skirts to complete the look. We also have a variety of chairs to serve your needs. Planning a trade show or conference? You can use back drops to cover the walls in your warehouse or to close off the three sides of your trade show booth. 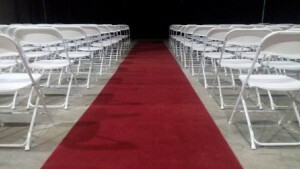 The Party Centre has risers that can be used to build a stage. 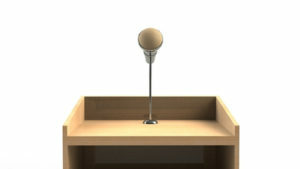 We can also provide you with a PA system with the option of a wireless microphone and a podium. Planning a Bbq for the employees this year? Or a staff family picnic coming up? Look no further, The Party Centre offers propane and charcoal Bbq’s. 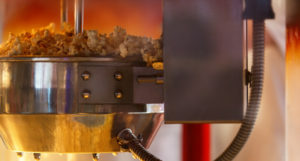 We also have a variety of concession machines to choose from such as popcorn, candy floss or Sno-cone machines. Our aim is to keep our corporate clients coming back to us. We offer great pricing and recognize that everyone has a budget to work with and we like to work with our clients accordingly. We strive to give the best service. We are flexible and will accommodate wherever we can to help make your event a successful event. The Party Centre is a one stop shop for all you need regardless of whether you are planning an Employee recognition Bbq, a customer appreciation luncheon or a nation wide corporate conference.